This tank is identical to my Light Up Tank (which seems to have been renamed Light Up Cycling Tank) that I got in the summer. I’ve listed mine for sale because the size 12 got too big on me but I otherwise really liked the tank for running. There were a few minor details that bothered me about the tank such as the contrasting vertical lines down both busts and the really thick ribbon of reflective strip on the straps. The tank is nice and loose fitting around the tummy which I really liked, especially after just having had a c-section. I’m liking the Speed Up Tank because it’s taken care of both those issues and it’s in a color that I love. 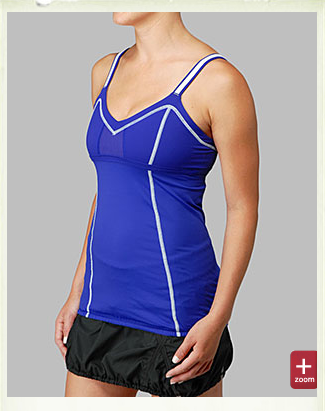 I’m not sure that I’ll be getting this one though because I seem to go for just two tanks when I run in the Spring/Summer. Either my Cool Racerbacks or my I Just Wanna Run Tank and I don’t gravitate towards my luxtreme tops.